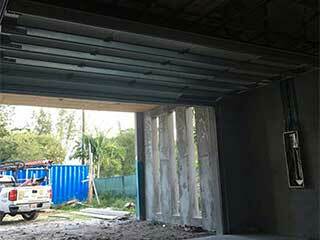 Most garage doors are quite solid and can withstand quite a lot. Like every other entrance to your home, you want it to be able to keep your family and possessions safe, and keep potential threats locked outside. If you live somewhere where the climate can get "volatile" at certain times, you may want to check your garage door's sturdiness and consider some reinforcements. The first factor to consider when deciding on whether or not to reinforce your garage door is the type of climate you live in. Some regions have a very mild climate so reinforcements may not be necessary, but if you live in a region that's prone to high winds, hurricanes, and god only knows what else, you may very well need to look at your options. As strong and sturdy as your door may appear, the fact that it is the largest entrance to your home also makes it the most vulnerable one. Preventing possible damage is always better than trying to fix things after the dust has settled. This is especially an important consideration when choosing your garage door. Remember to ask about the wind ratings of the door you're interested in. You can also inquire about reinforcing your current door. The absolute worst time to look into reinforcements is in the middle of a storm or windy season. The work needs to be done well in advance, so don't dally. The best way to make sure your door is fully prepared for the coming storms, is to have it reinforced by a professional. While it may be possible to perform some tasks by yourself, unless you have a lot of experience doing this, you'll want to avoid this option. You don't want to be halfway through the season and have your door's improvements break down suddenly. At the end of the day, the well-being of you and your family, as well as the condition of your home should always be your first priority. Whether you are choosing a brand new door or looking at reinforcing your existing door, you can avoid a lot of heartache by carefully considering your options and consulting with a professional. Our team at Garage Door Repair Middleburg will be more than happy to help you out. Call us today for more information.